Queen Cleopatra VII of Egypt and Marcus Antonius (and generals/admirals) against Gaius Octavius and Marcus Vipsanius Agrippa (and generals/admirals). 31 BC. 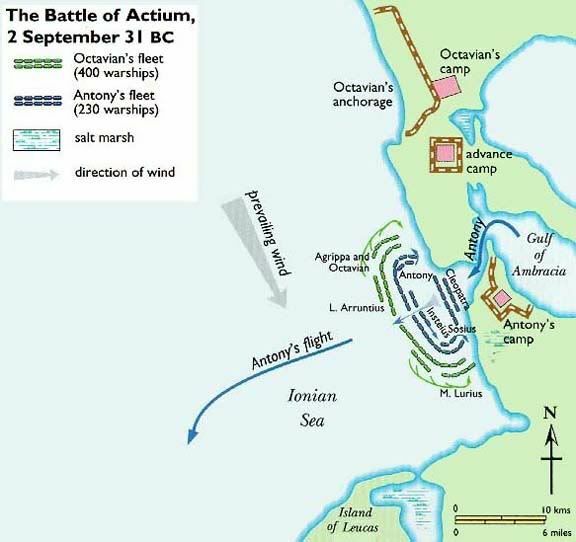 An epic sea battle fought at Actium in Greece, where after some initial fighting, Cleopatra fled the scene and Marc Anthony thinking all was lost followed her to leave his legions to the mercy of Octavius, who eventually become the first Emporer Augustus of Imperial Rome. The original map & preparation poll is at the bottom of this post. The HexesThe results of the preparation poll which indicated that map be done in hexagons, I used hexagons for the background sea, and joined two hexagons together to form smaller vessels. This was quite good actually as it enabled me to used the rear of the joined hex for the armies and the names go up front. Large vessels, named after those of the Commanders/Admirals/Preafecti of the fleets (after some experimentation) were given larger joined hexes on which to place artwork of quinqueremes and triremes used in this battle. Treatment was given to the orginal busts, placed on oval backgrounds similar to a brooch to identify who were the main players in this battle. One of the ideas for this design was that it could contain some mozaic tile-like design, thus the border became this weave of a typical roman era mozaic border. This map I think will appeal to many, as it reverts to the basic RISK type map, with basic conquer tactics. The only different aspect will be the bombardments allowed from the larger ships to their neighbouring large ships which is similar to the use of ballistas typical of roman army tactics. The colours used have been chosen from the list appropriate for the colour-blind. Octavian's groups have been allocated reds and browns, in conjunction with the fact that main colour used for the Roman Arny was the Regal Red, usually bordered by Gold. M. Antoinus' groups have been allocated blue, while Cleopatra was allocated Royal Purple as this was here favourite colour. The colours are strong, but not blinding or glaring, and should certainly not "hurt" anyone's eyes! Apart from the clearly defined large ship names for their commanders, two or three options were tossed about to name small vessels and armies. Oriiginally i wanted to go with using Oiii as in latin numbering, but decided not to go there as it would not appear in the XML in orer. Arabic numbers were considered but I thought that would have been ordinary. Finally i decided upon using Oa...Om as this would clearly define whose command ships were under, as well as providing a listing in the xml based on the alpha characters. This fits in very well within the bounds of the space restrictions, thus alos allowing a massive number of terts to be incorporated into the same size small map i use of about 600px wide by 500px high. For voting, a reference map is below for guidance. There are four considerations I would like the Forum to give guidance on. Results will be compiled in a spreadhseet and posted in this thread. Thanks heaps everyone (in advance)! Last edited by cairnswk on Fri Sep 10, 2010 6:20 am, edited 42 times in total. May I suggest using the Latin names Octavianus Caesar and Marcus Antonius for the map? Yes...thanks Ruben....I had actually seen that Castro...though i really don't like it, i may still use it...it looks more like something from the renaissance period. 4. A - Cartographer's choice. i'd like a poll to vote no against the idea We have a lot of ancient battle type maps in progress and this idea doesn't impress me. Maybe it's that history bores me a bit -- but i think the majority of people would like maps that appeal to a greater mass. zeppelin90 wrote: i'd like a poll to vote no against the idea We have a lot of ancient battle type maps in progress and this idea doesn't impress me. Maybe it's that history bores me a bit -- but i think the majority of people would like maps that appeal to a greater mass. Thanks zeppelin90...your comments are noted and appreciated. Personally I hope they are noted and instantly ignored. This is his personal opinion not what the majority think. Also if he doesn't like these type of maps he can always ignore them and play the others, no need to stop the development of a map. 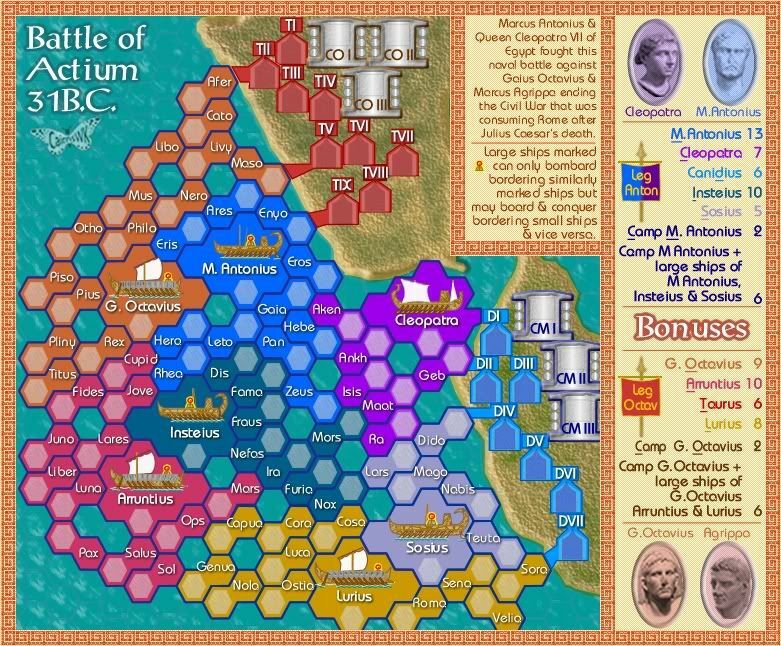 Any more suggestion options from Page 1 for the Battle of Actium? I liked the idea of 'Cleopatra's Flight' but it looks like the community thinks otherwise. anymore interest in this one for the preparation poll on P1? this is going nowhere fast community? Votes please if you're interested! anymore takers for this poll? I think I'll wait for a map at this point. Do you have a rough sketch? Coleman wrote: I think I'll wait for a map at this point. Coleman...do you have preferences for how this map should appear...this is the idea of this poll on P1. unriggable wrote: Do you have a rough sketch?